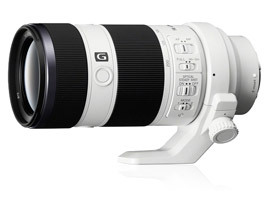 The Sony FE 70-200mm f4 G OSS is the last model to be released of the initial four lenses announced specifically for the full-frame mirrorless 36-Mpix A7R and 24-Mpix A7 models. This is the first model in the system’s line up not made in-conjunction with Zeiss. However, as a G-series model it promises both high-grade construction and superior optical quality. Like the other models in the line-up it’s intended for enthusiasts and has a complex optical construction consisting of a total of 21 elements in 15 groups and adopts both Super ED and ED glass as well as heavily contoured, molded aspherical lenses. The zoom also features the firm’s Nano AR coating for improved clarity and contrast and built in image stabilization but eschews the firm’s piezoelectric – sonic – type AF motor for a dual linear step-less type for smooth operation during video capture. Barrel-mounted focus-hold buttons and focus limiter functions, as well as a dust and moisture resistant construction add to the practicality of a lens like this. Unsurprisingly as a FE-mount model it’s also compatible with the firm’s earlier APS-C format NEX models (and current Alpha mirrorless models) where it’s the equivalent to a 105-300mm. The lens has a fairly standard minimum focus distance of 39.3” (1m), adopts a 72mm filter thread and measures approx. 3.15 x 6.89″ (80 x 175 mm) – roughly the same as similar spec’d models for FF DSLRs. Nor has Sony been able to make any real savings in weight, unfortunately, weighing in at 29.63 oz (840 g). The new lens is available for pre-order at $1,499, albeit including a removable tripod collar. 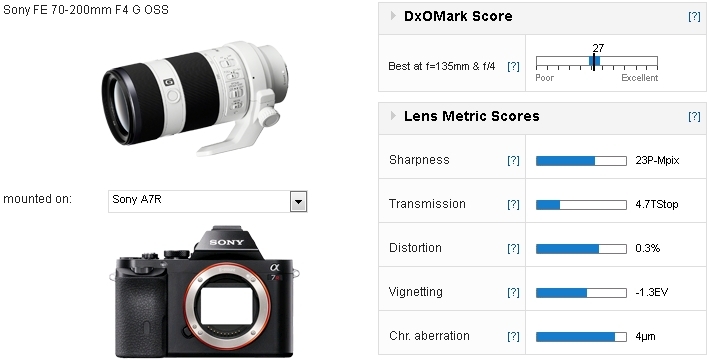 The Sony 70-200mm f4 achieves a DxOMark lens score of 27 points, a slightly higher overall score than the firm’s collaborative FE 24-70mm f4 offering. This is a very good score for a zoom like this. Peak sharpness is very high indeed and is one of the sharpest of its type, though bear in mind results will vary throughout the zoom range. As we’re used to with zooms, even high-grade models like this one, sharpness is highest and more uniform across the field at the shorter focal lengths. Despite that, the Sony is sharp still centrally at the initial aperture at 200mm with just some slight softening at the borders and corners. Chromatic aberration is exceptionally low and while it has fairly typical vignetting and low distortion over much of the range it does have slightly higher than expected pincushion at 200mm. But, overall the Sony has very good optical quality. Although a sharp lens there’s a slight drop in sharpness at the longer focal lengths, albeit in the outer field. Pitched against the most obvious rival, the similarly specified and relatively new AF-S Nikkor 70-200mm f4G ED VR, the Sony is practically a match. 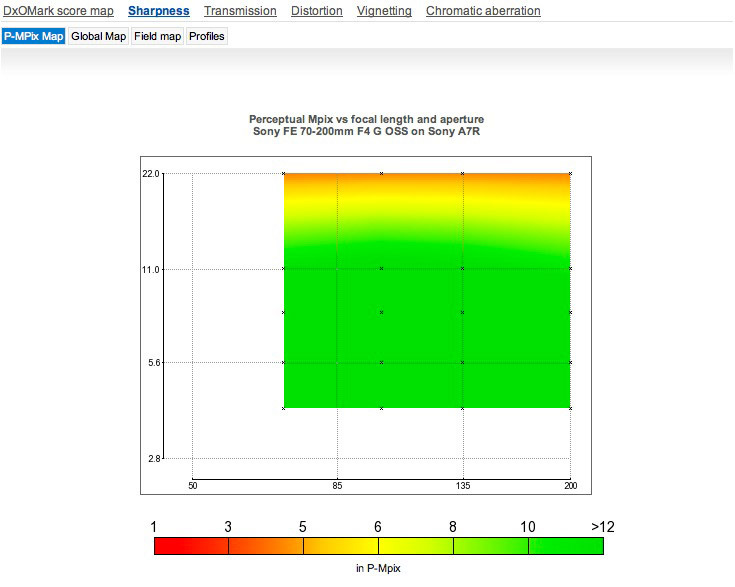 It can claim slightly higher peak sharpness, although it’s worth keeping in mind that the A7R sensor lacks an AA filter, which will give the Sony imaging chain a distinct advantage in sharpness. 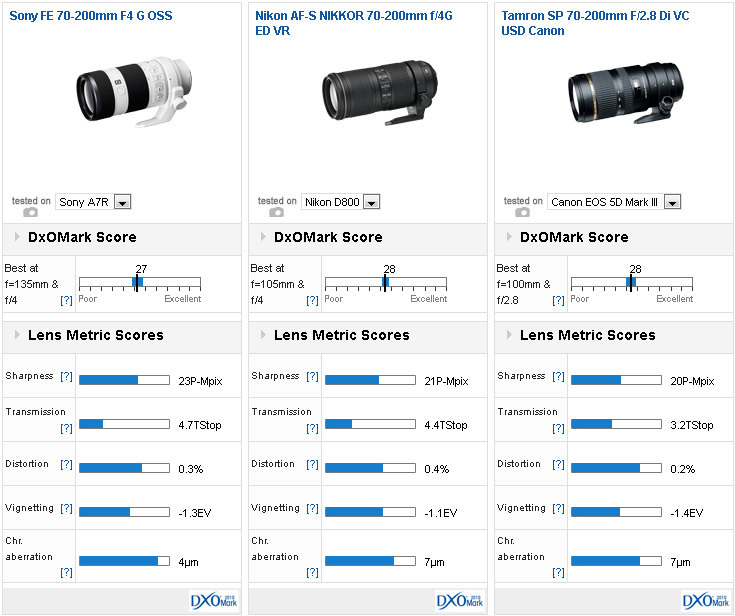 We fully expect that advantage to diminish against the Nikon D800E. The Nikkor has some slight advantages, however. It has more uniform performance over the zoom range, and is particularly impressive, outstanding even, wide-open at 200mm. At that setting, most of the gains in the Nikkor are in the outer field, with better sharpness and lower chromatic aberration. 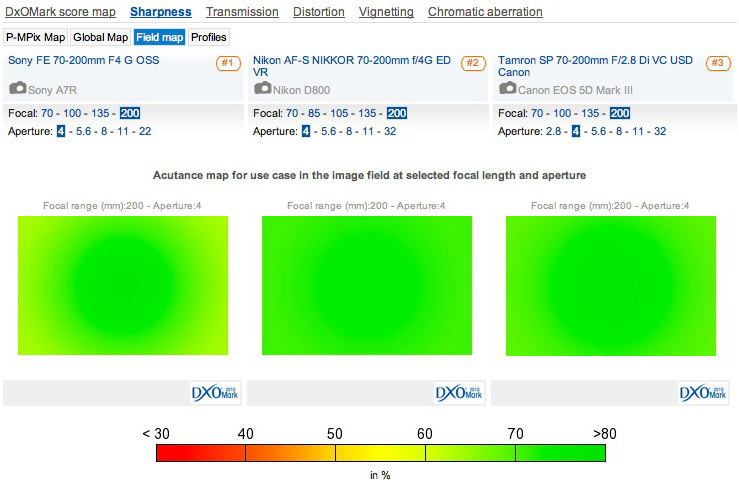 Vignetting is lower in the Nikkor only at shorter focal lengths. Although bigger, heavier and more expensive, the faster Tamron is another fine lens. It has similar peak sharpness (perhaps even superior sharpness on a higher resolution sensor) although at f4, at the longest setting, it’s slightly behind the Sony in the outer field. The Tamron has the lowest levels of distortion at any setting and has equally good control chromatic aberration as the Nikkor, which is just slightly better than the Sony. The Sony can’t quite match the Nikkor’s sharpness and uniformity at 200mm. The Sony’s performance is very good and sharpness levels are very high, and even though it can’t quite match the best in class – the Nikkor 70-200mm f4 – at 200mm, it’s still unlikely to disappoint. Coming bundled with a tripod collar, the Sony even slightly undercuts the rival Nikkor model, making the FE 70-200mm f4G OSS look good value without compromising on quality or practical features.